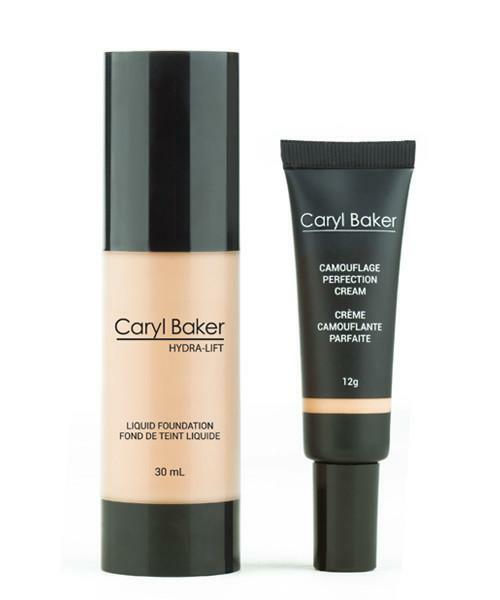 Caryl Baker Hydra-Lift Liquid Foundation - 30ml - $38.50 - in 10 shades: Light-Cool, Medium-Cool, Deep-Cool, Light-Warm, Medium-Warm, Med-Deep-Warm, Medium-Neutral, Med-Deep-Neutral, Deep-Neutral, and X-Deep-Neutral - with a silky, lightweight formula that absorbs easily as it smoothes onto skin providing light to full buildable coverage with long-lasting wear up to 6 hours. Contains osilift - derived from 100% atural sugars found in oat kernals, it binds to the skin's surface forming a viscoelastic cohesive biological film helping tone and smooth for an instant lifting effect and long-term anti-wrinkle benefits, emollient as well as moisturizing coconut oil to nurture skin and works to strengthen its natural protective barrier. Camouflage Perfection Cream - 12g - $25 - in 7 shades: Medium Cool, Light-Warm, Medium-Warm, Med-Deep-Warm, Medium-Neutral, Deep-neutral, Deep-Neutral and X-Deep-Neutral - a creamy, blendable complexion perfecter that conceals skin imperfections, darkness and discolouration as well as hydrates and protects the skin to help maintain elasticity and reduce the appearance of fine lines and wrinkles. Contains a beneficial blend of natural actives including antioxidant-protecting bisabolol - found in the bark of the Brazilian candeia tree, skin restoring ceramides and soothing emollients.